The circular walk as described starts from Pelter Bridge car park, but can be started anywhere enroute - plenty of parking in Grasmere itself. The walk heads initially around Rydal Water taking in a few caves. It then heads around Grasmere and then on into Grasmere itself, where you can avail yourself of the many cafes! The walk then heads out past Dove Cottage and the Wordsworth museum. The walk then heads through the woods before reaching Rydal Mount, one of the homes of William Wordsworth, before heading back to the car park. All the way around the walk are wonderful views across the lakes and of the surrounding fells. Parking: Pelter Bridge car park (grid reference NY 364 059). Take the A591 from Ambleside to Grasmere for about 3/4 mile, turn left and immediately pass over a humped back bridge. Then turn first right, go over a cattle grid, and the car park is a further twenty yards on the left. Leave Pelter Bridge car park back on to the lane entering it and turn left heading slightly uphill on to the road. The road initially bends around to the right past Cote How Guest House and then back around to the left before steadily climbing for about 150 metres and passing two cottages on the left-hand side. After a further 100 metres the road passes a line of 4 terraced cottages. Immediately on passing these, go through a gap on the left-hand side of a gate, which signifies the end of the metalled road. Continue on, along the walled track following the public bridleway sign. The bridleway heads initially downwards and around to the left, all the while under tree cover. A further 250 metres down the track go through the gate signed National Trust Loughrigg Fell and continue ahead, not following the path down to the shores of Rydal Water, which is now visible below. Across Rydal Water can now be seen Nab Cottage with Nab Scar rising up to Heron Pike behind it. Continue along the path following the direction of the shoreline of Rydal Water, but about 20 metres above it. A further three hundred metres on, the path bends around to the right at its intersection with a wall coming in from the right-hand side, and starts to climb. After about 15 metres the accompanying wall is replaced by a fence as the path climbs for about 50 metres around to the left. The path then flattens and a wall again replaces the fence where the path goes over a stream. Over the stream the path bends around to the right and immediately passes a large stone behind which there are two caves. These can be explored with care, but the more easily accessible cave is just a few yards further on. Go on past these caves where the path begins to climb and swings around to the left. Directly in front now a third much larger cave can be seen. Follow the path around up to the entrance of the cave. There are two easy ways to enter the cave, over the stepping stones or over the rocks to the right of them. Upon leaving the cave turn left in the direction of Grasmere continuing on the gravelled path along which the cave was reached. About fifty metres past the cave, the path becomes a little indistinct, but once over the rise the path onwards is now clearly visible ahead heading around the left-hand side of the small wood ahead. Over to the right Rydal Water can now again clearly be seen. Continue along this path around the side of the trees, then, where the path starts to descend, about one hundred and fifty metres ahead by a wall, can now be seen the junction of where this path meets with the one coming up from the shore of Rydal Water. About five metres past this meeting of the paths on the brow of a hill, the path splits with the left-hand fork rising slowly to go up on to Loughrigg Terrace. Ignore this and take the right-hand fork heading down towards the River Rothay, which runs part of its course between Grasmere and Rydal Water. The path initially pulls in alongside a wall, before the wall turns at right angles and goes steeply down to meet the water below. Continue ahead at this point heading for where the River Rothay leaves Grasmere. Just before reaching the water, pass through a wooden gate and continue onto the shore of the lake ignoring the path that goes down to cross the wooden footbridge over the Rothay. Walk around the shore of Grasmere until a wall is reached shortly before which there is a path that leads off left up hill. There is a kissing gate on the end of the wall, but walk to the right of this, between it and the water. Continue along the shoreline for a further twenty metres until a short flight of eight steps are reached, where the water meets a further wall, which lead up into the wood. Go up these steps and turn right onto a path coming in from the left. Ignore the path that leads further up in to the woods and keep ahead on the path, which keeps parallel to the shoreline about five metres away from the water. The path then exits the trees through a wooden gate and keeps near the shoreline all the while heading towards Grasmere. Go through another wooden gate before briefly passing behind a boathouse before returning the lakeside. When almost level with the centre of the island in the middle of the lake, the route to continue further along the shoreline is blocked by a wall. It is here where the path turns left away from the water and climbs uphill for a few hundred metres before it climbs a few wooden steps and then passes through a gate onto the Grasmere to Great Langdale Road. Upon meeting the road turn right and walk along it for just over half a mile into Grasmere. The road is very quiet and provides a few good views across to Heron Pike and Rydal Fell. The road passes the Gold Rill Hotel on the right-hand side as it starts to enter Grasmere. Continue on past a car park following the Ambleside sign, the on reaching the next junction turn right to pass in front of The Parish of St Oswald's Church. The road crosses over a bridge past the Stock Lane car and coach park before meeting a roundabout at its junction with the main A591 Ambleside to Keswick road. Take a right at the roundabout and cross over the A591 taking great care when crossing as this road can get very busy. About 10 metres from the roundabout, turn left up the lane signed for Wordsworth Trust Dove Cottage and Treasures of Wordsworth Trust. The lane then passes the Wordsworth Museum and Dove Cottage. William Wordsworth lived in Dove Cottage from 1799 until 1808, then rented accommodation in Grasmere for a further five years, before moving into Rydal Mount in 1813, where he lived until his death in 1850. Wordsworth was appointed as poet laureate in 1843 and received over the years many distinguished visitors ranging from Samuel Coleridge to Sir Walter Scott. Shortly after this take the left fork in the road, the right-hand fork going down to Dove Cottage tea-rooms, and continue on up the gentle incline. Around a few more bends, and as the lane bends around to the right, there is a sign stating no through road for motors and points up the steep hill directly ahead, next to a further sign for Ambleside A591 White Moss to the right. Take the road heading off steeply up hill (also signed path to Rydal and public footpath Alcock Tarn), passing after about thirty metres the Alcock Tarn footpath which leaves to the left. Continuing on past that, the road flattens and runs under tree cover just to the right of a wall. The road then climbs further before again flattening, where over to the right Rydal Water comes back in to view. The lane then becomes unmetalled and upon reaching Brockstone (two private houses), its width more than halves as it passes to the right of them. Then the path crosses a small stream before a few metres further on passing through a wooden gate upon which there is a warning for dog owners "Please note that the farmer can legally shoot your dog if it is found chasing sheep. Please keep your dog on a lead" A message to heed to if ever there was one! Through the gate there are more views over to Rydal Water. The path slowly climbs at the side of a wall, briefly flattens where Nab Scar is now in full view up to the left, then starts to descend still keeping close to the wall. After about thirty metres of descent the path splits with the right-hand fork continuing by the wall, whilst the left fork goes diagonally away from the wall almost keeping to the same level before slowly starting to rise. Take this left fork, negotiate the way over the tree roots on the rise ahead, and drop down the few metres to pass through another wooden gate in the wall. Continue on through another gate and keep to the path by the side of the wall. 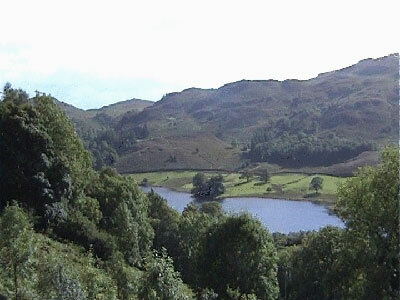 Rydal Water is now much nearer over to the right, and beyond that the caves visited at the start of the walk can be seen in the Loughrigg Fell hillside. The path then goes through a gap in a wall where a gate used to be, on through the next gate, where Ambleside and Wansfell can now be seen in the distance. The path falls, flattens, rises then passes through a gate immediately after three large trees. It passes through one further gate before passing out on to a metalled road. After a small gravel section on the road, turn right and head down the hill past the Rydal Mount (home of William Wordsworth 1813-1850), then on past St Mary's church. St Mary's church was built in 1824 by Lady Le Fleming of Rydal Hall. William Wordsworth worshipped here and was warden in 1833. A few metres past the church turn left on to the A591, and cross over the road after about thirty metres, again taking great care, before turning right a few hundred metres further on over the humped back bridge, then right again to go up the lane back to the car park.